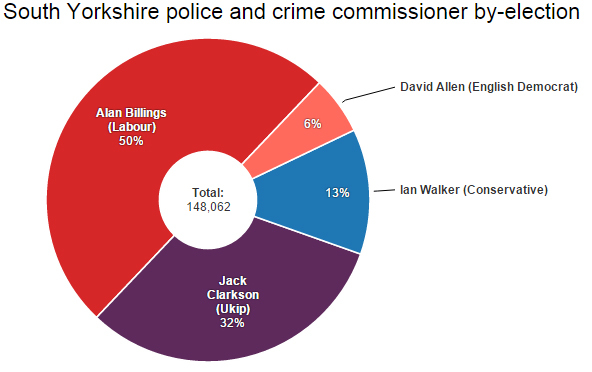 The Labour party’s comfortable win in Thursday’s South Yorkshire PCC by-election should not have been unexpected. The loose talk about Ukip being in with a chance was a textbook example of political fantasy running ahead of political fact. As I mentioned earlier this week, the line-up of candidates and the demographics of the region both looked set to work in Labour’s favour. And so it proved. Labour topped the poll in each of the four counting areas – even in Rotherham, home of the scandal that triggered the by-election in the first place. Labour performed particularly strongly in the metropolitan areas of the region. It won 57% of the vote in Sheffield against Ukip’s 26%. Again, this should not have been unexpected. Ukip is not a metropolitan party – it prides itself on such – and South Yorkshire boasts a dozen or so metropolitan parliamentary constituencies. The poor showing of the English Democrat candidate was perhaps a surprise. David Allen came second in the contest in 2012. This time he came last. In fact, in each of the four counting areas the final rankings were the same: Labour first, Ukip second, Tories third, English Democrats fourth. With the Liberal Democrats not even bothering to field a candidate, Labour benefited from its three rivals splitting the right-wing vote. That the Tories failed to outrank Ukip in any of the four counts should not have been a shock to either party. The result will steady Labour’s nerves and hopefully call a halt to the Ukip inflation game, which of late has seen the party’s prospects elevated out of all proportion to reality. What the result also does is confirm the continuing failure of PCCs to command the attention, let alone excitement, of the population. Turnout on Thursday wasn’t quite as low as that seen in the West Midlands by-election in August, when only 10.2% of the electorate voted. This time 14.88% took part – almost identical to the number who voted in the 2012 election (14.93%). But that’s still pretty pathetic, and more ammunition for Labour and the Lib Dems who both say they would scrap PCCs if they win the general election.